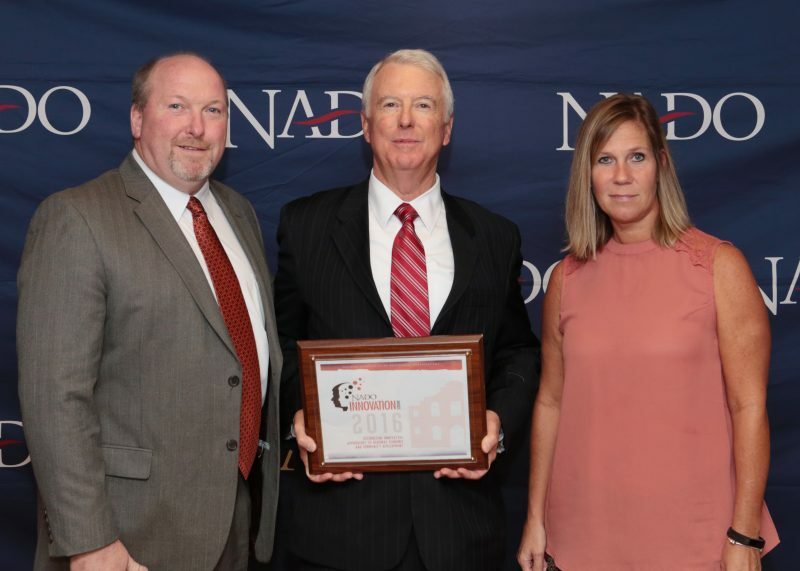 Ohio Valley Regional Development Commission based in Waverly, Ohio has received a 2016 Innovation Award from the National Association of Development Organizations (NADO) for the Jackson County Industrial Site Selection Study. A collaboration between Ohio Valley Regional Development Commission (OVRDC) and Jackson County Economic Development Board (JCEDB) to study and identify possible sites for a 200-300 acre industrial property located in Jackson County, Ohio. The study used GIS and data analysis to identify contiguous land parcels that have the possibility of being zoned and developed for industrial uses. Criteria such as land use/ownership, floodways, parcel attributes, utility availability were used to develop scoring criteria and ranking index. Print maps and an interactive web portal were the deliverables of this project. NADO is a Washington, DC-based association that promotes programs and policies that strengthen local governments, communities, and economies through regional cooperation, program delivery, and comprehensive strategies. The association’s Innovation Awards program recognizes regional development organizations and their partners for improving the economic and community competitiveness of our nation’s regions and local communities. Award-winning projects were honored during NADO’s 2016 Annual Training Conference, held October 15-18 in San Antonio, Texas. The 2016 class of award recipients consists of 96 projects spanning 28 states. These projects are presented in an interactive “Story Map” developed by NADO and Esri and include project summaries, funding information, and partners. The Story Map is available online at: https://www.nado.org/innovation-awards/. “Since 1986 through its Innovation Awards program, NADO has recognized the transformative work regional development organizations perform every day. Award-winning projects showcase best practices across the country in regional development that support prosperous communities, stronger local economies, and improved quality of life for residents,” said 2015-2016 NADO Board President Jeffrey Kiely, Executive Director of the Northwest New Mexico Council of Governments, located in Gallup, New Mexico.